1. Preheat the oven to 180oC, gas mark 4. Butter the insides of 6 x 250ml ramekins and add a little more to the bottom to make sure they don't stick. 2. Melt the butter with the chocolate in a bowl over a pan of simmering water. Mix the eggs and sugar together and whisk until thick and fluffy. 3. Lightly fold the chocolate into the egg mixture, then fold in the flour, coffee and Nutella. 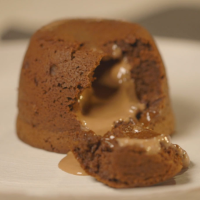 Pour the mixture into the ramekins and insert one chocolate truffle ball into the centre of each ramekin. 4. Cook for 12-15 minutes, or until they are cooked round the edges and still gooey in the middle. This recipe was first published in Fri Jan 06 13:35:29 GMT 2017.